I’m currently sat at home, alone, watching boring stuff on TV and waiting for my discount food (Goes off today) to cook and I realise that I haven’t typed up one of my usually mundane weekly updates. Then I think “Won’t bother, nobody reads them!”, but then I realise it doesn’t matter if 1 person reads it, as long as I enjoy writing and that 1 person enjoys reading it, then it’s worth the effort! So here goes…. Some people may not know, but only 5% of babies are actually born on their predicted due date. That’s a really small selection! I am reminded of this a lot, but when you’re expecting anything be it a holiday or an anniversary, you have to countdown to a particular day. For that reason alone, I still base our countdown to the due date. So for those keeping score, we are now 69 days away from expanding our family! 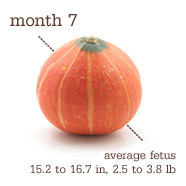 It’s our second week as a squash. *As baby’s skin smoothes out, her brain just keeps getting more wrinkled. All those grooves and indentations increase surface area, meaning more room for that oh-so-essential brain tissue. She’s also adding some brawn — her grip is now strong enough to grasp a finger. Christine, is still (Luckily) feeling great. So great in fact, she has abandoned me for the week to go on a work trip to Spain. She received her fit to fly and has jetted off on a break provided as a reward from her workplace. So many people have said that they wouldn’t have gone to such a hot country when so far into their pregnancy, but as I knew when I met her, my wife is different! Unfortunately, I am a worrier, so I won’t sleep properly until she brings herself and our little bump home at the weekend. So now May is out of the way, we move onto June, then July will come and go and it will be August and I will be saying to anybody that listens “I’m going to become a daddy this month!”, but until then I will continue to entertain my 1 reader, you know who you are *Waves*. As it’s my blog and quite frankly I can do as I pleaseJ, I would like to say congratulations to friends of ours Claire and Jim, who welcomed a beautiful baby girl into the world on Sunday 5th June, weighing in at 7lb 7oz. It may feel like no one reads it but they do, well I do! Anyway like you said as long as you enjoy writing them and think years from now you can be reading this with your child, surely the only incentive we need as parent or parent2be bloggers! The big 30 not long to go it will come in pretty quickly now. Glad everything is still going well sounds like its been a great pregnancy so far. I guess I am now your 6th visitor today! Hey dad…fab blog.